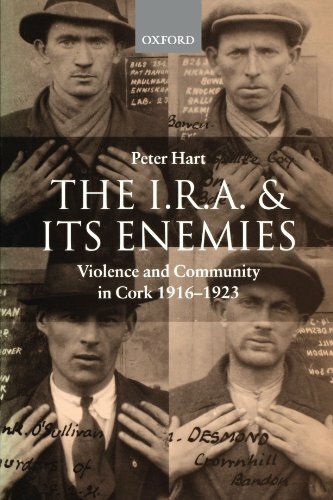 Canadian historian Peter Hart has gained notoriety both in Ireland and abroad in recent years, with a number of fellow historians and academics accusing him of being one of the chief ‘apologist historians’ for British rule in Ireland, and the Irish Revolutionary period in particular, and this book (undoubtedly his most controversial work) does little to dispel those accusations. Despite the detailed use of data on the background of Irish Republican Army Volunteers and Irish Republican activists in general, as well as other worthwhile research presented in the pages of this book, Hart’s all too clear political and national biases unfortunately swamp everything else and leave many question marks over both his facts and figures and the conclusions he draws from them. Anyone who is familiar with the pages of the noted `Irish History’ magazine as well several new books on the history of the Irish Revolution, will know that `The IRA and its Enemies’ has been subject to careful analysis by a long line of academics and has been found to be severely wanting. Unfortunately inaccuracies, distortions, misinformation and an absence of crucial facts seem to abound, and thorough examinations and documentation of these in various printed publications as well as online have left this work with a bad reputation for academic neutrality. The numerous accusations that Hart falsified or invented fake testimonies in relation to IRA `atrocities’ he claimed occurred (including witness statements from people who had died before he could ever have possibly interviewed them) remain unanswered both by him and his defenders. In recent times evidence has emerged that he deliberately edited a number of documents in order to prove the argument he was trying to make, even though in some cases the full documentation in fact disproved his arguments. `…in the South [of Ireland] the Protestants and those who supported the government rarely gave much information because, except by chance, they did not have it to give’. This gives a very different sense to the whole conversation and it’s obvious to see why Hart felt the need to censor the part that undermined his own argument. Deliberate omissions like this abound throughout the text, the end result turning a history book into little more than a propaganda pamphlet. The sheer weight of evidence against Hart, and the allegations in this work in particular, have grown enormously in recent years and so far seem irrefutable. All those who suffered and died in Ireland’s struggle for freedom and independence, from all sides and all nationalities and loyalties, deserved better. Those seeking a more honest and reflective account along fairly similar lines are far better directed to the much praised “Spies, Informers and the ‘Anti-Sinn Fein Society’: The Intelligence War in Cork City 1919-1921” by American historian John Borgonovo. There is much, much more of that.